We arrived in Opua in the Bay of Islands on the North Island and checked into the country after an eight day passage from Tonga.. The New Zealand Customs and Immigration Services are very efficient and, upon arrival, they directed us to a floating dock which was isolated from the rest of the marina. They boarded us and searched for and confiscated any food or material that wasn’t allowed. They made a great first impression on us as they were the most polite and understanding government officials we’d met to date. Just about anyone arriving here by boat had been at sea for a week or more, so it’s a joyous landfall made even better by the kind attitude of the first people you meet. Coming down from Tonga, we began to see the outline of New Zealand’s northern Cape when we were still about 50 miles away. Later, on a road trip, we visited Cape Reinga and we took the photo below. This is the point where the Tasman Sea meets the Pacific Ocean. Click on the photo (or any photo on the website for that matter) and you will see a larger image. Once it has exploded open, on many of the photos, you can click again on the magnifier icon in the lower right corner and it will give you even greater detail. On the New Zealand map above, Opua is next to Paiha on the very northeast tip of the North Island. We stayed in Opua for almost a week before heading south to Auckland. The Louis Vuitton Cup racing, the prelude to the Americas Cup, was underway and we wanted to get there for the festivities. We took a leisurely sail south to Auckland. But, we were hit by a gale just as we approached the entry to Whangarei. The jut of land there is called Bream’s Head and it has notoriously rough and difficult seas whenever the wind is blowing at gale force levels. We can attest to this! So, we took refuge around the hook of land at Urquhart’s Bay and waited overnight for the wind to subside. The next day, we sailed south in calm waters and light winds past the Hen and Chicken Islands to Kawau Island and our first look at the Hauraki Gulf. 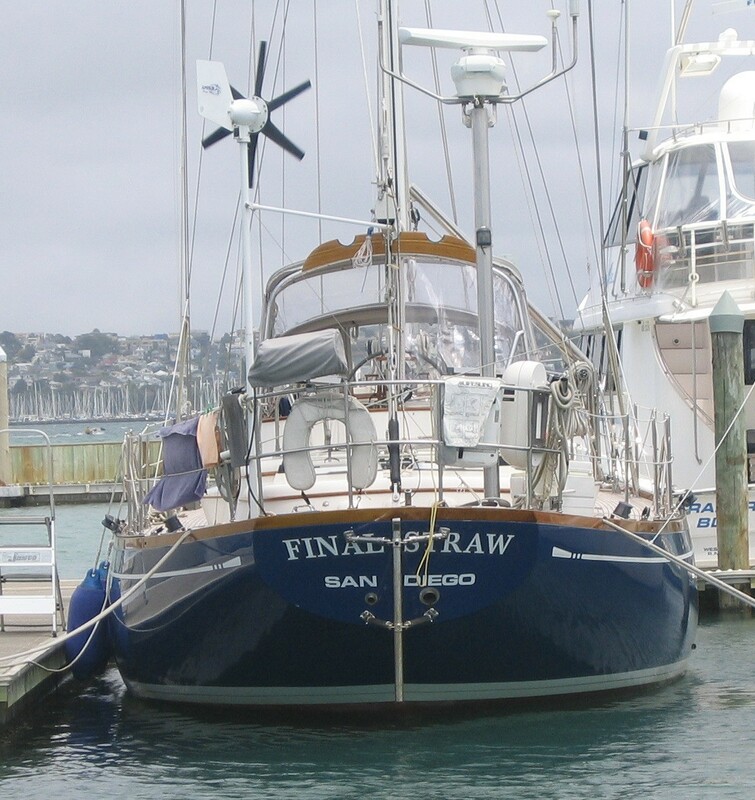 After spending the night anchored at Kawau Island (near Warkworth on the map), we sailed down to Auckland and Bayswater Marina. We passed many spectator boats coming out from Auckland for the day’s Louis Vuitton Cup racing. Among the megayachts, we saw Larry Ellison’s (Chairman and CEO of Oracle) 244 foot motor yacht Katana. For anyone that’s interested, she’s now for sale and can be yours for a paltry $68,000,000! We arrived at Bayswater just after noon and settled into our slip where Final Straw has been for over a year. This became our home away from home and we’ve really enjoyed having all the conveniences again after spending eight months at sea. We appreciate even more how nice it is to go to a grocery store or a nearby restaurant or a movie once we arrived here. It was a pretty comfortable and scenic spot. 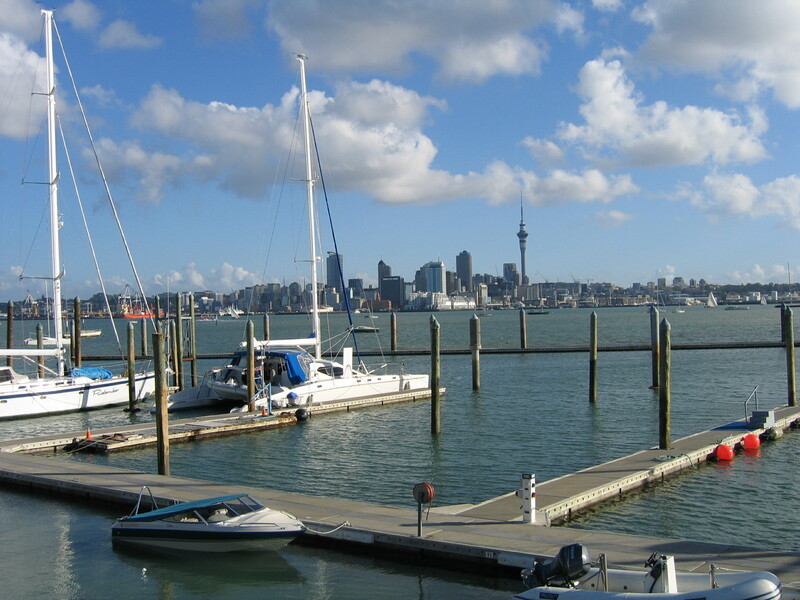 Bayswater Marina is located just across Auckland Harbour from the city. It has a convenient ferry service that goes from the marina to the downtown area every hour. We had spectacular views of the city right from our slip. One of the other amenities here was free internet access. There’s a lounge for the yachties (as they call us here) that had several PC’s or you could use a new wireless internet system and have high speed access right from your boat. We used the latter and transmitted our signal direct from the computer on Final Straw to an antenna about 50 meters away. From there it went to the marina’s office server and the server sent the signal across Auckland Harbour to the Sky Tower where it connected into the internet. Pretty high tech! Bayswater is located on the north shore of Auckland between the towns of Takapuna and Devonport. During the year we stayed here, we got to know the area pretty well. We bought a car and had transportation to travel around New Zealand to our heart’s content. The photo below shows a view of Cheltenham Beach from North Head, a park that overlooks the town of Devonport. This view is looking north at the Hauraki Gulf and Whangaparaoa Penninsula out in the distance. The Americas Cup yacht racing was held in the area just to the right of the picture below. During this timeframe, our attention turned towards the 2002 Louis Vuitton Cup, which was already underway, and the Americas Cup races that would begin just after the new year. To read more about watching the races and visits outside of Auckland, click here.